•I really didn’t want details, I was just being polite. •I don’t really have time to listen so hurry up. •Oh that’s too much, I didn’t expect you to have problems. Probably not, but you certainly feel like that’s what they mean when you’re snubbed after being asked, don’t you? Time to recognize, honor and be a good steward of your real friends. They may not always say what you want to hear, or be able to do what you want them to do; but you have decided they are your friend, mentor, coach, confident, etc. for a reason. 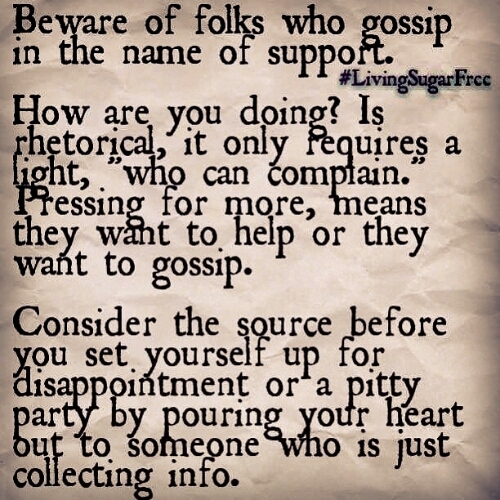 Don’t waste your time looking for a shoulder or ear with folks you don’t know and/or don’t trust. Shared from What Makes An Eagle Quack Like A Duck? There's a not so fine line between being nice and being naive when making decisions about your friends, partners and social circles. Some folks deceive themselves into thinking that they are being nice when they carry on with relationships that are unfruitful and unproductive. But when you refuse to walk away from someone that you know lacks integrity, is cruel or manipulative it is because you fear the possibility of being alone. If you have a business, this article is a must read. If you don't have a business, this article is a must read. People are much more in control of their environment, career, life, etc. when they are fully literate. Yes I know you can read and write; but are you fully literate? Does social media affect the value of relationships; the ability to trust an individual or organization; and the overall flow of currency in an economy?